Some people get their highs by helping people. The positive majority of people take this route. They love to encourage other people when acting as parents, educators, coaches, leaders, trusted advisors or playing other roles. They love to nurture people. They care for others and, when faced by difficult situations, try to get win-win solutions. Such people want to plant seeds of hope that encourage both present and future generations. Some people get their highs by hurting people. The psychopathic minority of people take this route. They like to feel powerful in their roles as bullies, narcissists, sadists, critics or whatever. Such people are often addicted to anger. They try to make themselves feel big by making others feel small. They not only want to win, they want others to feel they have lost. People often feel good after helping others. They can experience a rush, followed by a sense of calm. It is as if they have served something much greater than themselves. 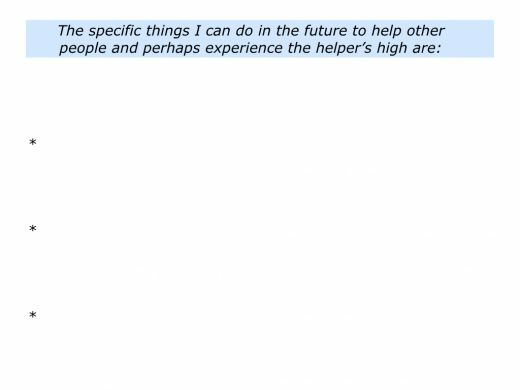 Sometimes they experience what is called the helper’s high. 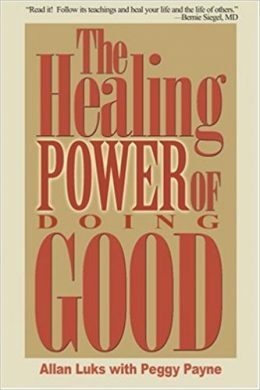 Allan Luks and Peggy Payne used this term in their book The Healing Power of Doing Good. 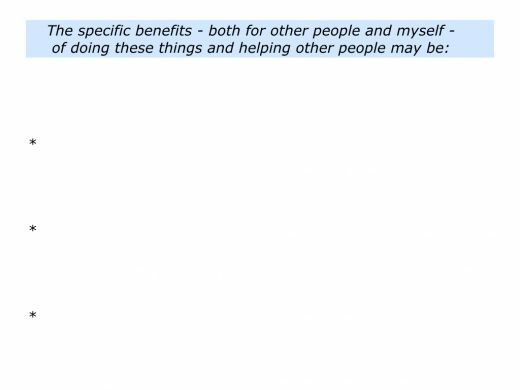 They found that people who helped others also received benefits themselves. Below is an extract from Allan’s website. Whilst the piece focuses on volunteering, the same principle applies to helping others in our daily lives. Looking at your own life, when do you experience such highs? You may get such feelings after encouraging people, serving nourishing food, passing on knowledge, creating beauty, helping people through crises or whatever. If you wish, try tackling the exercise on this theme. This invites you to describe the things you do that sometimes lead to you experiencing the helper’s high. 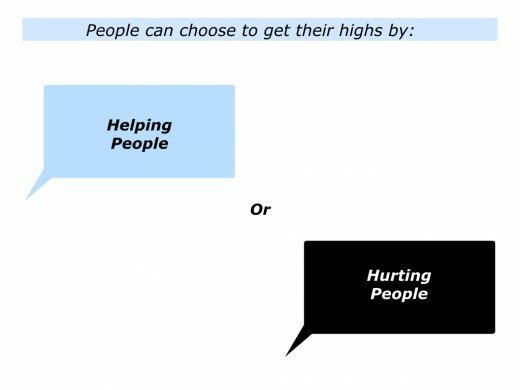 People make individual choices about whether they choose to help people or hurt people. The choices they make are often influenced by several factors. These include the following. The personal models they have in life – such as parents and other key people – and how they choose to be influenced by these models. The personal choices they make to satisfy their needs and feel successful. 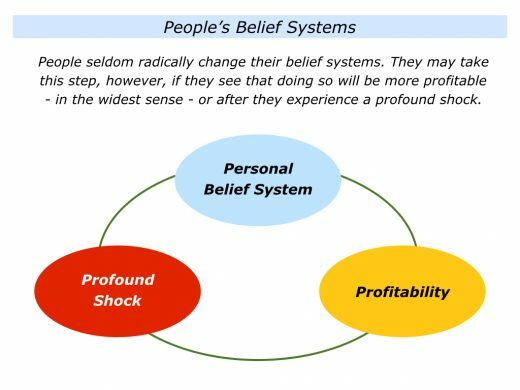 The personal belief system they develop and how they translate this into behaviour. We are strongly influenced by the people who act as models for us. The words they say and actions they take show what they believe is important in life. Such people can include our parents, friends, peers, teachers and others we admire. Some people have models who are generous, caring and encourage other people. Some people have models who are greedy, cruel and exploit other people. As they grow older, people can choose whether or not they want to follow similar values. Looking at my own life, I had many positive models who believed it was important to help others. My parents were supportive and at school I was left alone to learn in my own way. One teacher encouraged me by explaining that, providing I kept showing fighting spirit, I could shape my future life. When working in a factory I was helped by a teacher who invited me to their evening GCE English class. They showed me another world and after six years I was able to get out of the factory. Searching to do full time voluntary work, eventually I met Alec Dickson, the founder of Voluntary Service Overseas and Community Service Volunteers. He also believed that, in the act of giving, the giver received as much as the receiver. CSV gave me the opportunity to become a housefather for mentally handicapped children. Since that day I have always had the opportunity to do fulfilling work. Many people reported similar meetings with Alec that changed their lives. Here is an extract from an obituary written about him after his death in 1994. It was written by Martin Stephen for The Independent. Everybody makes choices in their daily life and work. 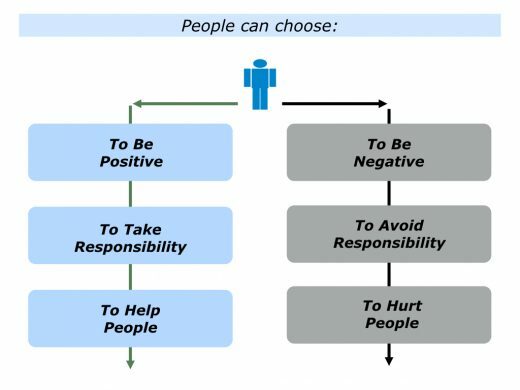 A person can choose to be positive or negative, to take responsibility or avoid responsibility, to help people or hurt people. People choose different ways to satisfy their needs and feel successful. The choices they make have consequences, both for themselves and other people. Some people choose responsible ways to satisfy their needs. They try to behave in ways that help both themselves and other people. They sometimes make mistakes, of course, but they then try to improve and help other people. Some people choose irresponsible ways to satisfy their needs. They behave in ways that satisfy themselves but hurt other people. They sometimes actually enjoy the feeling of power when inflicting pain on other people. People who love to give to others often feel happier afterwards. They aim to create a win for the other person and, in the process, find they get a win for themselves. Many people behave in a kind and helpful way, however, even though there does not appear to be an immediate pay off. They do so because of their personal belief system. There are many models for understanding people. One approach focuses on their background, belief system and behaviour. The key element here is their belief system. A person’s belief system often acts as an internal compass that directs their behaviour. It is often made up of the following things. Personal Beliefs – they build a set of beliefs about what they believe is important in life. Personal Interpretations – they may interpret events in ways that confirm their beliefs about life. Personal Behaviour – they translate their beliefs into action by behaving in ways that they believe will help them to achieve what is important in life. Person A may believe in being kind, encouraging and caring for the planet. They will translate their belief system into action by doing things that encourage both present and future generations. When faced by bad news, they will take responsibility and try to find positive solutions. Person B may believe the main goal in life is to make money. They will translate their belief system into action by making profits in ways that exploit people and the planet. When faced by bad news, they may avoid taking responsibility and blame other people. People sometimes change their belief systems, but this only happens in certain circumstances. A person may be motivated by profitability – in its widest sense – or profound shock. These experiences can lead to making personal changes. They see that behaving in a different way will – in the widest sense – be more profitable. It will give them more pleasure, less pain and enable them to achieve success. They have a profound shock that changes their attitude to life. It changes what they believe is important in life and their picture of success. They focus on what they have to gain and choose to behave in different ways. They get some quick wins, keep following their daily disciplines and achieve their picture of success. People are often more motivated over the long term by the carrot rather than the stick. A person who enjoys giving to others, for example, may find it brings ongoing joy to themselves and others. Allan Luks and Peggy Payne describe the experiences of Mary, a volunteer, who enjoys a feeling transcendent calm after giving her best. Here they describe what Mary says about this feeling. Let’s return to your own life and work. Imagine that you want to help others and perhaps, in the process, sometimes enjoy the helper’s high. This could be in your personal or professional life. What can you do to help other people? How can you do more of these things in the future? What may be the benefits both for yourself and other people? Describe the specific things you can do in the future to help other people and perhaps, as a by-product, experience the helper’s high. Describe the specific benefits – both for other people and yourself – of doing these things to help other people.